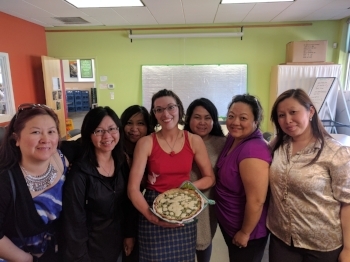 Can't even tell you how cute these women were and how excited they were to try the recipe after. Swoon. This recipe was created for my monthly Cooking with Co-Op Basics class at Mississippi Market. I've left the brands and prices just in case someone out there is interested. Preheat the oven to 350ºF. Thinly slice the potatoes using a mandoline or sharp knife—they should be ⅛-inch thick or thinner. Place them in a large bowl and toss them with olive oil (at least a couple of tablespoons) and with a generous pinch of salt and pepper. Line the quiche pan (pie plate, cast iron skillet, etc.) with the potatoes, overlapping them as you arrange them. Be sure the layer of potatoes closest to the edge extends above the rim and use more than you expect - they will shrink as they cook. Place the pan on a sheet pan and transfer to the oven. Bake for 20 minutes. Meanwhile, place 1 egg and the flour in a large bowl and whisk until smooth. Whisk in the remaining 4 eggs until blended. In a medium bowl, stir the yogurt and whole milk until smooth. Pour the egg mixture through a fine mesh sieve held over the milk mixture. Whisk in the salt, pepper and herbs. Pour the egg mixture into the par-cooked potato crust. Reduce the oven temperature to 325ºF and bake until the filling is just set, about 40 minutes. The center of the quiche should still feel slightly firm, rather than liquidy, when touched. Let cool on a wire rack for at least 20 minutes to allow the custard to set up, so that it will slice neatly. It can be served warm or at room temperature. To serve a fully cooled quiche warm, cover it with aluminum foil and reheat it in a 325ºF for about 15 minutes. 1/2 Bag Sno-Pac Broccoli, 1/2 can drained diced tomatoes, mozzarella cheese. As with all the recipes I teach here, it is meant to be adapted to what is on sale or in season. This is intended to be a template for creating a light but satisfying pasta with local produce. The process of pan roasting vegetables, adding pasta water, and cooking the pasta in the pan and sauce can be adapted for spring, summer, fall and winter vegetables. Aim for 4-6 cups of vegetables per box of pasta, depending on how many leafy vegetables you use. During the late winter, I usually use radishes, cabbage, carrots, and other root vegetables. In the spring I use peas, green garlic, baby spinach, hakurei turnips or baby beets. For summer, my only suggestion is if tomatoes or fresh herbs towards the end but go wild with whatever vegetables you have leftover from the farmers market or store that you need to use up. Winter squashes or sweet potatoes taste great along with broccoli, kale and brussel sprouts for when those cold nights creep back in, though you may have to dice your harder vegetables like butternut squash a bit smaller and make sure they are over halfway cooked through before adding your other veggies. Enjoy! Meanwhile, warm the olive oil or butter in a large Dutch oven or large saute pan over medium heat. Once the oil is shimmering, add the chopped onion and bell pepper with a pinch of salt. Cook, stirring often, until the onion has softened and is turning translucent, about 6 to 8 minutes. Begin cooking your pasta as directed, stirring occasionally. Add the frozen vegetables and dried Italian Seasoning. Cook until vegetables have caramelized (their water has evaporated and parts are staring to brown) while stirring often, about 5 minutes. Sprinkle in granulated garlic and ground pepper and stir for 1 minute. Add half a cup of the pasta water to the vegetables. Reduce heat to medium low. Reserve one cup of pasta water on the side. When pasta is still slightly hard in the middle, drain and add to vegetables. Toss together while over low heat. Add 1/2 cup Parmesan cheese and pasta water in small increments to create enough sauce to coat pasta and vegetables. Continue simmering until the pasta has softened to your liking. Remove the pot from heat, taste and season with more salt to taste. Top each serving with grated Parmesan, and red pepper flakes. This recipe was created for my monthly Cooking with Co-Op Basics class at Mississippi Market. I've left the brands and prices just in case someone out there is interested. The recipe was adapted from one I think is simple and easy to follow from Jack Bishop of America's Test Kitchen. As with all the recipes I teach here, it is meant to be adapted to what is on sale or in season. Heat the oil and 2 Tbs. butter in a heavy-bottomed medium pot. Add the shallots or onion and saute over medium heat until softened, about 3 minutes. Using a wooden spoon, stir in the rice and cook for 1 minute. Add the wine and cook just until the alcohol aroma fades, 1 to 2 minutes. Add 1/2 cup of the warm stock and cook, stirring frequently, until the rice absorbs the liquid. Continue adding stock in 1/2 cup increments, stirring, for 15 - 20 minutes. Add salt & pepper to taste. Add the frozen peas and continue cooking, stirring, until the rice is creamy and soft but still a bit al dente, about 5 minutes. Remove the pot from the heat and vigorously stir in the remaining 2 Tbs. butter and the 1/2 cup cheese. Add salt to taste. Divide the risotto among individual soup bowls. Serve immediately with more grated cheese. This recipe is meant to be adapted to your own tastes and mood so you don't get bored. 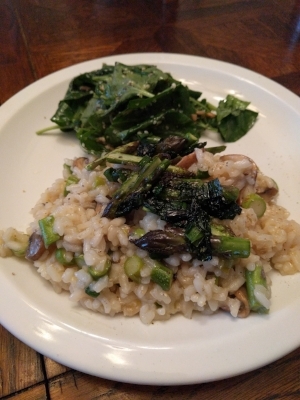 You can saute 2 cups of mushrooms with 2 cloves of garlic and use the stems to make a mushroom broth. Or you can use one jar of Co-Op Basics Marinara instead of chicken broth into a tomato and basil flavor & use Sno-Pac Spinach or Broccoli. If using fresh vegetables, pan roast the choicest parts and finely chop any stems to add near the end of the cooking process. Soak beans overnight in enough liquid to cover 3-4 inches above beans. Drain. Slow cook with enough water to cover by 2 inches. To maximize effort, consider cooking enough beans for multiple meals and freezing or refrigerating extra. Beans will keep 4-5 days in the refrigerator. Alternative uses include bean spread or hummus, adding to salads, or bulking up soups and stews. Slice winter squash into rings or half and slice into half rings about 1 inch thick. If you are nervous about cutting into the thick skin of the squash, place your hand on the top of the knive and rock the handle back and forth in a saw-like motion to cut off the base and give you a flat surface to use while you cut the squash in half. Cut off skin if squash is not an acorn, carnival, or delicata squash. Remove center pulp and seeds. Rinse seeds and set aside. Dice the squash into 1/2-1" pieces. Toss in a bowl with 2 tbsp oil and place on baking sheet in a single layer with some space empty for seeds later. Sprinkle with 1/2 tsp salt, 1/4tsp garlic granules and 1/2 tsp ginger. Place in oven on upper-middle shelf. Place seeds into oiled bowl and set aside. Heat remaining 2 tbsp oil in a large sautée or sauce pan over medium heat. Sautée onion until soft. Add frozen vegetables and remaining salt, ginger and garlic. Sautée 2-3 minutes until bottom of pan begins to brown and reduce heat to low. Stir in tomatoes, coconut cream, soy sauce, beans, and 1/2 cup bean cooking broth. Simmer on low, stirring frequently until squash can be added. Check squash pieces for doneness - a fork should be inserted easily. Add the seeds to the sheet pan and roast another 5 minutes. Remove pan from oven. Carefully move squash into sauce pan with other ingredients, saving seeds for garnishing. Add additional bean broth to thin the saute to desired consistency (some people like a thicker sauce). 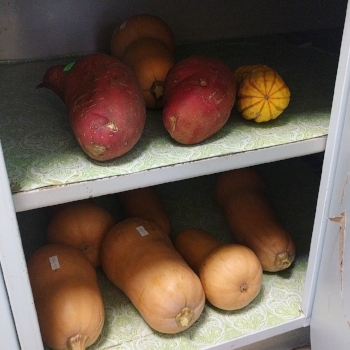 Stock up & store: most winter squashes will last months in a cool dark cupboard! Flavor Alternatives: this recipe is meant to be adapted to your own tastes and mood so you don't get bored. Crushed red pepper flakes can be added for increased spiciness to taste. Wilty greens or diced stems of broccoli, collards, kale, mustards or other greens can be added with the beans. Any other preferred frozen vegetable can be substituted. This recipe can be turned into a soup by adding 2 cups of vegetable or chicken stock and an additional can of tomatoes. Consider the following combinations instead of garbanzo beans, coconut cream, and ginger. Navy Beans, 1 tbsp Dried Basil, 1/2 tsp Dried Thyme (or 1.5 tbsp Italian Seasoning). Garnish with parmesan cheese. Black Beans, 1/2 tsp Ground Cumin, 1/2 tsp Ground Coriander. Garnish with cojita or cheddar cheese or salsa. Garbanzo Beans, 1 tbsp + 1 tbsp Indian Curry Powder or 1 tbsp ground turmeric & 1 tbsp Garam Masala. Or omit beans and keep the coconut cream, add 2 tbsp curry paste (green or red). Garnish with squeeze of lime and fresh cilantro or ground coriander.